Well I am finally moving back into the studio. Its been a long holiday season with my entire studio having been in bits and pieces all over my living room. There wasn't even anyplace to put a tree. just a bit more in the basement and I will be able to finally start creating again. One good thing about this past flood and having everything up in the livingroom was that I finally broke down and inventoried my entire stamp collection. I had stamp sets I didn't even know I had let alone a couple of duplicate sets. Now I have a spreadsheet of every image and sentiment that I own. Now no more hunting thru sets to find what I am looking for. Just a few short keystrokes with a keyword search and I know exactly what set to go hunt for. I also labeled all my stamp sets in larger letters so the ole eyes can see the name of the set. Eventually I will transform my spread sheet into an access database to make it even easier, but for right now its doing the trick. My car on the other hand has not been faring so well. I hate cars. I had to dump a grand (that I didn't have) into the car this week just to be able to drive it up here in the wild snowy northeast. Grrrrrrr. Since the ice storm, everything I own that "runs" like water(plumbing), electricity, car, computers, etc has had some sort of issue for me to deal with. One of my native grandmothers says that creator is testing me. FOR WHAT?!!!! I would like to know. At this rate I must have a pretty big job ahead of me to get this much testing. LOL So to help pay for the car being fixed I am offering many of my stamps sets for sale. Please email me if you would like any of these sets. All my sets are in excellent condition. If you don't like the price, make me an offer. FYI - I am not (nor have I ever been) a demonstrator for any company. Just little ole me paring down my stock in order to pay for work that needs to be done on my car with over 200K miles. FYI - Shipping is additional and will be paid by buyer. Items will be shipped within 24 hours of payment being received. Shipping charges will be exact and $1.00 will be added to cover the cost of envelopes, time and gas to post office. If you don't feel this is unreasonable, please PM me and we will try to work something out. I will update this post as necessary and will keep all items on sale thru 1/10/08 at which time they will head to ebay. Want it all? Make me an offer. This past weekend I had the pleasure of going to visit my friend Island Stamper up at her place on Chebeague Island in Maine. I have been going over to the island for about 10 years now. I always have fun over there. Just getting there is half the fun. On Saturday I headed up. I parked my car and got on the bus. When I got off the bus I had a few minutes to enjoy the cove of Cousins Island while I waited for the ferry. Once I saw the ferry my heart started beating hard. I just LOVE riding the ferry. I always stand on the back deck and watch the waves that the ferry makes. After 15 minutes I finally arrived at Chebeague Island. After a bunch of catching up we had some lunch and sat out on the deck. I love the view from the deck. It’s just beautiful with all the boats in the harbor and the waves lapping just a few short feet from the deck. People in the cove were starting to get ready for Hurricane Hanna to come in. Most took their motors out of their boats. Friends helping friends. Island Stamper and I headed to the boat house to grab some stamps and other supplies so that we could create some cards together. She did some ATC’s and I did some cards and images. I grabbed her bag of scraps, because those of you who read this blog often know I am currently addicted to scraps. I love making cards at Island Stamper’s place because it’s like being in a scrapbook store. She has EVERYTHING! I got to play with a scorepal, some magnet closures, water color pencils and crayons. It was sooo cool. No matter what I said I wished I had or wanted to try, she had it. LOL Pics of my cards are at the end of the post. Then the sky turned and things started getting dark. We went to a cocktail party at a friend’s house and by the time we left the rain had started. Then Hanna came in full force. I actually tried to take a pic outside under the deck but there was just too much water and wind. Sunday morning I got up early and took some pics. Now my camera shoots in color but the photos came out pretty much black and white because there was such a lack of color. After spending some time on the deck the sun came out and I noticed that one of the boats in the cove didn’t make it that well thru the storm. It was pretty much submerged. Can you see it in the picture? Its above and to the left of the words. Click to enlarge. The deputy sheriff even came by and with the help of two other men, pulled the boat out of the water. It really was quite the site. It was even better when later that day the owner came with his sons and buckets to bail out the boat. Unfortunately my time on the island was just too short. So I headed back to the boat and made the long trip back to Mass. I am already hoping to get back to the island soon. So here are the cards I made with the help of Island Stampers Stash. This is the one I was working on when I got to play with the Scorepal and the water color pencils and some distressing ink. Click on the pic to enlarge it. This next one is a gate fold card. I got to play with magnet closures on this card. I used water color pencils. Of course Island Stamper had the perfect embellies (asian medals) for this card. 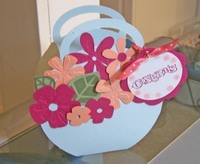 This vase I created won Altered Item of the Day on Tuesday over at Scrapbook Supplies Forum. I actually had a clean sweep that day, also taking Layout of the Day (Birthday Girl LO posted 8/28) and Card of the Day (Thinking of you Card posted 8/29) awards. I created this using some scrap (as usual) rub ons that I had left over from a kit I got from an SEI workshop at CKC in May. I had no idea why I was hanging onto these rub ons for so long. But I wanted to use them because they were so "happy" looking. Work was getting rid of a bunch of vases, so I grabbed one on my way out the door and headed home to create. One thing I figured out very quickly was to use some mini glue dots to hold the rub on in place on the glass. Did you know glass is slippery? LOL At first I couldn't figure out why the rub ons were moving all over the place. Jeesh! Duh. Well I had had a long day! (That's my story and I'm stickin to it). For a full size image, click on the picture. So the other day I am walking thru the Walmart craft section and I spy the Martha Stewart line that they are now carrying. I stopped to look and an acrylic stamp set of 4 various birds catches my attention. All the stamps are a good size and the price isn't bad either at $8.99. So I take the bait and buy the set. Finally tonight I got a chance to open the package. The packaging is actually pretty good, very much like a 5x7 CD case. Inside the stamps are stored on a piece of acetate with the images printed on it. Although the stamps were pretty hard to peel off the first time, the acrylic was a really nice quality which surprised the heck outta me considering its MS and Walmart. Now don't get me wrong, I love my Wally world, but I really didn't expect this quality from the stamps they carry. And with some of the mixed reviews I have heard about MS line of scrapbooking items from my friends, well I had preconcieved notions which were put in the dust tonight. The images stamped very clean and clear. They also cleaned up very easily with my regular stamp cleaner. I'm going to look at her other stamps soon, since they are very simple and elegant. Timeless and classic. 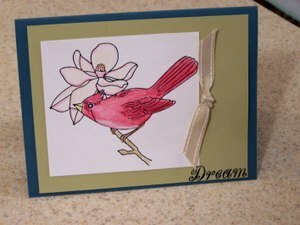 So that you can see some of the images, I made two cards tonight using the Bird Stamp set from Martha Stewart (I have not seen this set anywhere but Walmart). For this card I used SU River Rock and Bayou Blue, River Rock double stitched ribbon, and my Prisma pencils. I did a bit of antiquing around the image and then tore the paper and rounded up the edges. 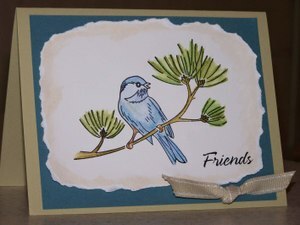 For this image I used the same basic ingredients but used a different image from the same Martha Steward Bird Stamp Set. Hope you found this useful and liked the cards. Have a great day! I cut the bag using the Cricut AE cartridge by using the tall ball feature for the square bag. I used a 12x12 mat and paper and used the fit to size option. Then I cut our various flowers in different sizes and also cut some leaves out using the Walk in my Garden Cart. I cut a 3" scallop using AE and the blackout option. Then cut a 2.5" circle and stamped on the circle. I really loved how this came out. In the end it stood around 7" tall. I was able to fit 2 votives and a votive holder inside nicely. When making this I found it was important to use a very strong tape. I used my trusty ATG tape. Which sticks like mad! Give it a try. I will definatly be using this bag idea again.